Football Future: Gulu, Uganda - Students Helping Children Across Borders, Inc.
During the summer of 2013, SCHAB’s project manager Bobby McLaughlin developed a soccer field and recreation-playground construction project in Gulu, Uganda. The project was specially designed to mobilize the student and teacher community at Ocer Campion Jesuit College to collaboratively construct new sports facilities and launch formal recreation programming. The project got off to a great start as Bobby quickly organized the staff and students to work through each phase of construction. Together they built a basketball court, volleyball court, and a full soccer field build. The courts used commercial hoops and nets on murom clay. Bobby and the school staff packed this murom to make an ideal all-weather playing surface that is level. Around the new soccer field, murom is being used to make a 6 lane track for the school’s track and field programs. 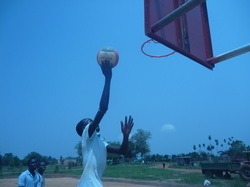 The project, through gathering donated materials, has also bought all sorts of soccer and other sports equipment to the school and aspiring athletes of Gulu. Bobby used the construction process to create learning opportunities for the students. He led math/graphing classes, designed to teach critical numeracy and measuring skills. As an empowerment project, Football Future thoroughly used the project process, not just the end result, to mobilize the youth in Gulu and have them actively participate in developing their minds, wellness, and community. To learn about the project Football Future, click here. To view the Football Future photo gallery, click here.